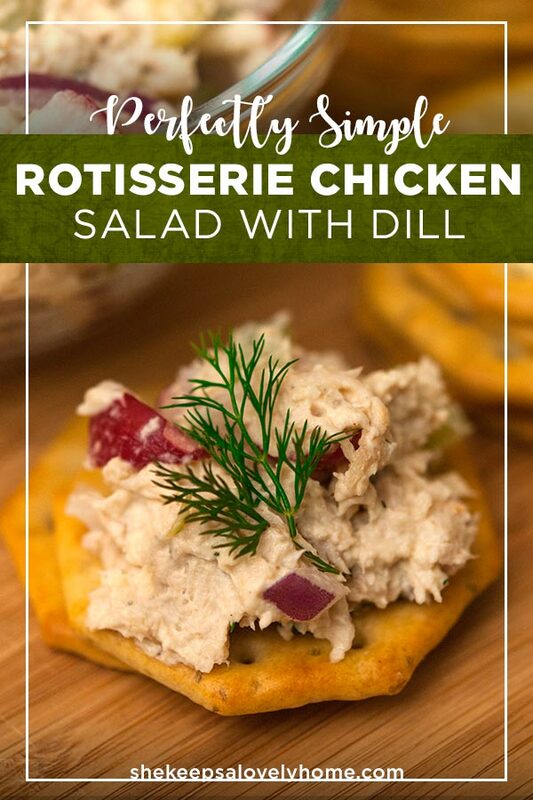 This easy rotisserie chicken salad with dill has a delightful zing and a celery-radish crunch! 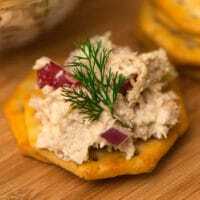 Serve this chicken salad with crackers or use it to make the tastiest sandwiches at the picnic! 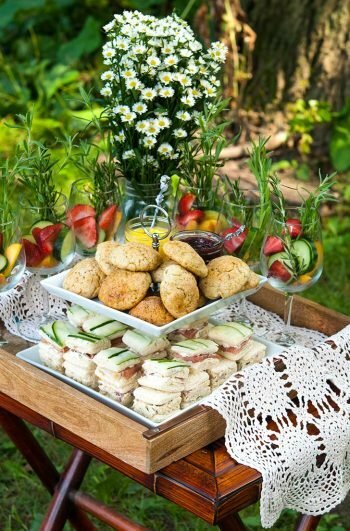 I was looking for a way to bring a tasty lunch to the beach with friends, but didn’t want to pack a bunch of sandwiches that would only feed 4 or 5 people. It takes only a half hour to make, and you can serve it right away. You can also save it for at least a week in the fridge and it’s just as tasty as the day you made it! 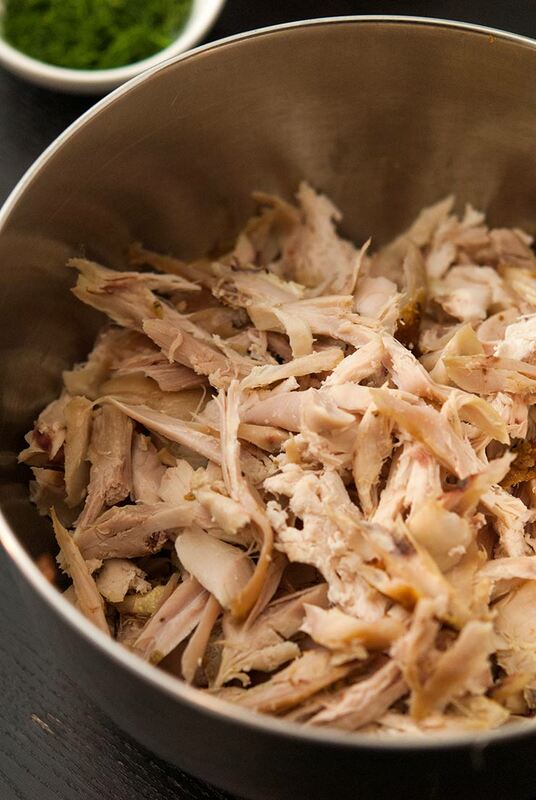 Allow your rotisserie chicken to cool for at least an hour in the fridge before you mix in your other ingredients. Otherwise, the heat from the chicken will heat your mayo and warming mayo tends to make its oils separate in not so appetizing ways. Save the carcass, and any other vegetables you didn’t use to make your own chicken broth! No reason to let all that tastiness go to waste! if you have a crock pot, simply toss everything you didn’t use for your chicken salad into it. Toss every part of the chicken that you didn’t use right in the pot with all the spare vegetables. Add a tbsp. of apple cider vinegar and a tsp. of salt into the pot with enough water to cover the ingredients. If you’ve got a head of garlic, crush it and throw that in there too! Cook on low for 8 hours, skim the fat that rises to the top when it’s done, and you’ll have the tastiest chicken broth! If you have any trouble finding a tasty dill mustard like this, no worries! 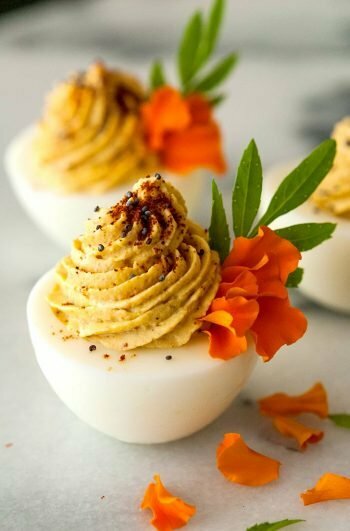 Simply use spicy deli mustard, and add twice as much fresh dill as the recipe calls for. It won’t be exactly the same, but it will still have that fresh, herbal garden flavor. If you’re not too into mayo, you can substitute sour cream instead. But you might want to use a little less mustard because the sour cream will make it pretty tangy on it’s own. Pulling back on the mustard will dim the zing. And if you want to cut down on the calories, you can also substitute mayo with 2 mashed Hass avocados. I’d suggest adding them to a food processor to make sure they’re really creamy before they’re mixed into the chicken. 1. Gather your ingredients and chop your celery. I slice each stalk down the middle and chop so my pieces aren’t too big, but also not too small. Set aside ¾ of a cup of chopped celery. 2. Chop your red onion into teeny pieces, but not so small that they’re pulverized or mushy. Set aside ½ cup of chopped red onion. 3. 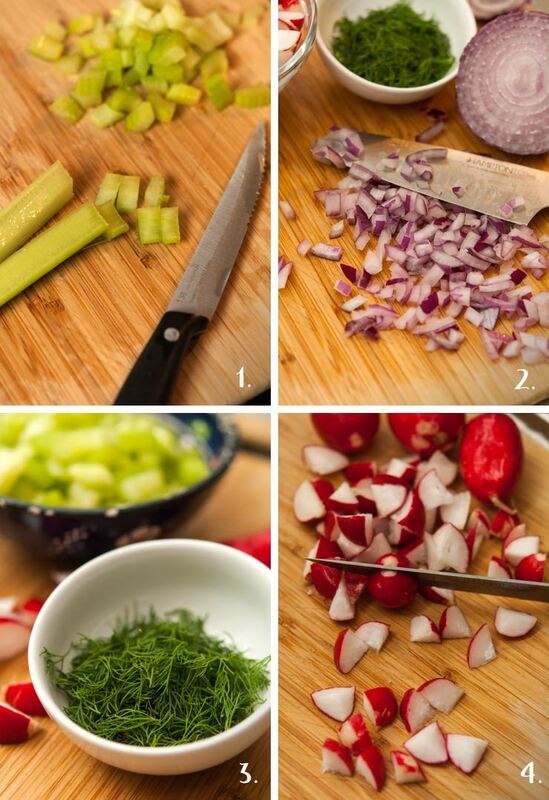 Use the freshest dill you can find and pull the tiny fronds from the stems. Set aside 1½ tbsp. of dill fronds. 4. Chop your radishes. I like to chop medium sized radishes into 8ths and 9ths. I like the pieces to be a bit chunky so there’s a nice radish crunch to the chicken salad. 5. 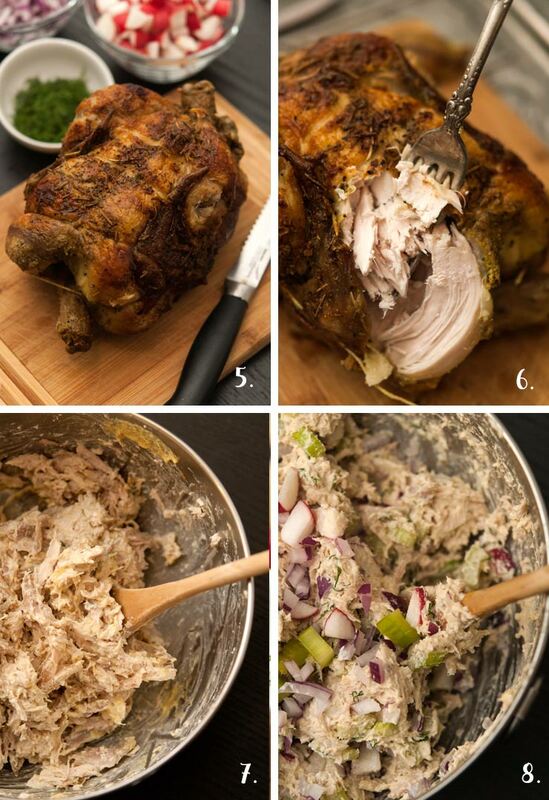 Place your tasty, chilled rotisserie chicken on a cutting board and cut the strings. 7. Add your mayo and mustard and mix thoroughly. 8. Once your chicken is nicely stirred, add your celery, onion, dill, radishes, a sprinkle of salt and pepper, give it all a good stir, and you’re all done! Isn’t it tasty!? This easy rotisserie chicken salad with dill mustard has a delightful zing and a celery-radish crunch! You'll require a cutting board, medium-sized mixing bowl, wooden spoon and sharp knife for this recipe. Gather your ingredients and chop your celery. I slice each stalk sown the middle and chop so my pieces aren’t too big, but also not too small. Set aside ¾ of a cup of chopped celery. Chop your red onion into teeny pieces, but not so small that they’re pulverized or mushy. Set aside ½ cup of chopped red onion. Use the freshest dill you can find and pull the tiny fronds from the stems. Set aside 1½ tbsp. of dill fronds. Chop your radishes. I like to chop medium sized radishes into 8ths and 9ths. I like the pieces to be a bit chunky so there’s a nice radish crunch to the chicken salad. Place your tasty, chilled rotisserie chicken on a cutting board and cut the strings. Add your mayo and mustard and mix thoroughly. Once your chicken is nicely stirred, add your celery, onion, dill, radishes, a sprinkle of salt and pepper, give it all a good stir, and you’re all done! isn’t it tasty! ?